since 1985 by offering creative and quality video editing services. a commercial advertisement within budget, your unique vision will begin to unfold once you consult with our professional editing team. Houston Video Editing uses quality video editing software to edit creative stories for businesses, corporate events, presentations, etc,. 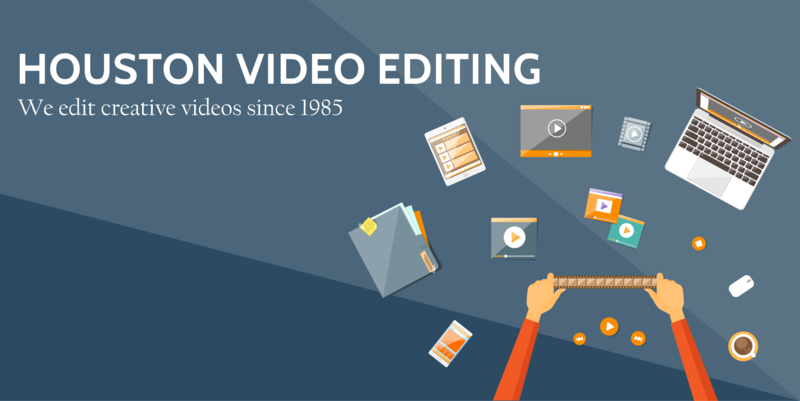 In order for a message to be effective to your audience, Houston Video Editing team can organize and transform your video by adding top video editing effects! We will record and produce voiceover and narration audio for training, corporate, and any other type of videos. Did you shoot a video using your laptop’s webcam? Our skilled team can upload and professionally edit video files captured from various devices. Although video editing can sound difficult, all you have to do is pick up the phone, talk to us about your video ideas, and allow Houston Video Editing to begin editing your video! Our professionals, who have trained for over 25 years in video editing, are ready to eliminate any video editing challenge you are facing. Houston Video Editing company is ready to offer you reasonable rates after you contact us for a free consultation TODAY at 713-269-3094. "What I liked the most was the quality of the video animations, graphics and titles. You guys are simply the best! Many thanks for an excellent job." “They were able to take our 'rough draft' of ideas and convert them into a professional and succinct video."